1836 Sarah Worrall Lankford (Phoebe Palmer’s sister) founds the Tuesday Meeting for the Promotion of Holiness in New York City. Charles Finney lectures on holiness in New York City. John Humphrey Noyes founds a perfectionist intentional community at Putney, Vermont—precursor to his controversial Oneida (New York) community. 1837 Phoebe Worrall Palmer experiences entire sanctification. Timothy Merritt founds the Guide to Christian Perfection, later Guide to Holiness. 1843 Orange Scott organizes the Wesleyan Methodist Connection at Utica, New York. Phoebe Palmer publishes The Way of Holiness. 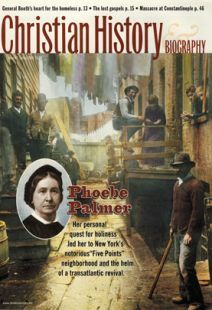 1850 The Five Points Mission is founded in New York City by Phoebe Palmer and other Methodist women. 1857 Extensive revivals break out in Ontario, Canada as a result of Phoebe Palmer’s ministry. 1858 The Presbyterian W. E. Boardman’s fast-selling Higher Christian Life popularizes holiness in non-Methodist terms. 1859 Phoebe Palmer publishes The Promise of the Father, a closely argued biblical defense of women in ministry that would influence Catherine Booth, cofounder of the Salvation Army. 1860 B.T. Roberts and John Wesley Redfield found the Free Methodist Church on ideals of abolition, egalitarianism, and holiness. 1867 The first National Holiness Association (NHA) camp meeting is held at Vineland, New Jersey. 1871 The Western Holiness Association—first of the regional associations that prefigured “come-outism"—is formed at Bloomington, Illinois. 1874 Hannah Whitall Smith and Robert Pearsall Smith speak in England at the ecumenical Broadlands and Oxford meetings in England for the promotion of holiness. 1875 The first Keswick Convention meets. 1877 General holiness conventions meet in Cincinnati and New York City. 1878 William and Catherine Booth organize the Salvation Army. 1881 D. S. Warner starts the Church of God Reformation Movement, later the Church of God (Anderson, Indiana). 1886 The first Salvation Army home for “fallen women” is founded in New York City. 1895 First Church of the Nazarene is founded in Los Angeles, California. 1901 Alma White founds the Pentecostal Union, later Pillar of Fire. 1906 The Azusa Street Revival in Los Angeles marks the beginning of Pentecostalism. 1907 The Pentecostal Church of the Nazarene is organized in Chicago. 1908 The Church of the Nazarene is founded. 1910 The Brethren in Christ adopt a holiness statement on sanctification. 1923 Methodist college president and holiness preacher Henry Clay Morrison founds Asbury Theological Seminary in Wilmore, Kentucky. 1835 A group of abolitionist students leave Lane Seminary of Cincinnati to join the newly formed Oberlin College, making that school a reform center. 1844 Methodist Episcopal Church divides into Northern and Southern denominations. 1852 Harriet Beecher Stowe publishes Uncle Tom’s Cabin. Stowe was sympathetic to the holiness movement and wrote on sanctification. 1866 Frances Willard, who later became president of the Women’s Christian Temperance Union, professes sanctification under the Palmers. 1871 D. L. Moody experiences his “enduement of power.” Two years later, he begins his first great U.K. campaign. 1890 Moody’s Chicago Bible Institute building dedicated. 1939 The Methodist Episcopal Church (North and South) re-unites and re-absorbs an earlier offshoot, the Methodist Protestant Church, to form The Methodist Church.